Ordering oysters online is a great way to sample oysters you haven't tried, or to get fresh oysters you love sent right to your home. One place where you can get fresh oysters shipped directly to you is the online store of Taylor Shellfish Farms. Taylor Shellfish Farms, located in the Pacific Northwest, has been growing shellfish in the bays and inlets of Puget Sound for over 100 years, and they have mastered the art of packing and shipping oysters from the sea to your home. ice packs, still cold. The treasure chest as I describe it, is actually a best selling item at Taylor Shellfish called an Oyster Gift Box 1. My Oyster Gift Box 1 contained two dozen oysters. Six each of the Virginicas, Pacifics, Kumamotos & Olympias. You'll notice in the picture to the left that the Gift Box also contained an oyster shucking knife. It was fun to try a different knife and add to my knife collection. The Box also came with a descriptive oyster profile paper complete with text and photos, a link to a website for help with pairing oysters with wine, and a guide to shucking oysters. The two dozen oysters made a great appetizer for two of us. My wife is new to shucking oysters and she was able to follow the directions provided and shuck her own oysters. It will be nice to have another shucker around!! The only thing she needed that was not provided was a glove. Fortunately, I have plenty of extra gloves. While gloves are not mandatory, they might come in handy if you are new to shucking but you can always use a towel. Here are few more pictures of the oysters. in each oyster, we really were able to taste the flavors of Puget Sound 3000 miles away! If you've been on the fence about ordering live raw oysters, it time to get over it and order them. 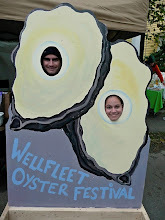 Just be sure to order them from a reputable oyster farm such as Taylor Shellfish! When you do, tell them that Josh at Go Shuck An Oyster sent you. Do you know an oyster lover or osteaphile? The oyster box would make a great gift. The Taylor Shellfish store can be reached online at www.taylorshellfishstore.com or by calling 360-432-3300. Place your order today and then get ready to Go Shuck An Oyster!